At the suggestion of Truman Capote, Patricia Highsmith wrote her first novel, Strangers on a Train, which was published in 1950. 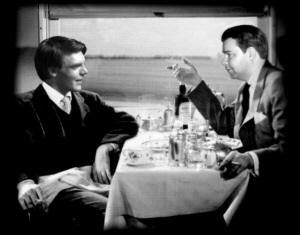 The following year it was made into what would become one of Alfred Hitchcock’s best feature films, starring Farley Granger and Robert Walker as the two strangers who meet in the dining car of a train: Guy Hains, an ambitious architect, and Charles Bruno, a charming but spoilt mother’s boy with a liking for drink. Because they are strangers they “can say anything they like” to one another. So much so that Bruno proposes the perfect murder: he will kill Guy’s feckless, unfaithful wife, and in return, Guy will kill Bruno’s much-hated father. Amused, Guy parts from Bruno never imagining he will see him again or that Bruno was serious. But Bruno was deadly serious and when he kills Guy’s wife, he expects Guy to fulfil his part of the proposition. This is a brilliant example of what theatre exit surveys have shown to be the most popular dramatic genre – the psychological thriller. Craig Warner’s recent adaptation, seen to critical acclaim in 2000, is a gripping play and faithful to Highsmith’s book.